[Updated at 10:38 a.m.] A suicide bomber was responsible for the blast at Moscow's Domodedovo Aiport on Monday, Russian state TV reported. The station said the handmade bomb was stuffed with metal objects to increase shrapnel from the explosion. The state-run ITAR-TASS news agency said the explosion occurred at the international arrivals section of the airport. Another state media outlet earlier said it happened at a baggage claim area. [Updated at 10:33 a.m.] As police went on high alert around the capital city, Russian President Dmitry Medvedev called security chiefs to an emergency meeting at the Kremlin to discuss the situation. [Updated at 10:06 a.m.] Flights destined for Moscow's Domodedovo Airport are being redirected to other airports in Moscow, either Sheremetyevo or Vnukovo, according to Russian TV. Domodedovo is located about 14 miles southeast of Moscow, and the airport's website says it's the largest and busiest of the airports in the capital. [Updated at 10:04 a.m.] State TV is reporting that the blast at a Moscow airport erupted at the baggage claim area, killing 31 people. The Health Ministry provided the media outlet with the death toll, it said. CNN is seeking details on the Russian Investigative Committee report that terrorists are responsible for the explosion. [Updated at 9:53 a.m.] The Russian government is confirming the death toll of 31 people and says 130 people were injured in the Moscow airport blast. [Updated at 9:48 a.m.] Russian state TV reported 31 people are dead and more than 100 others were injured in an explosion at Domodedovo Airport in Moscow. In a post on its website, the Russian Investigative Committee is blaming terrorists for the attack. 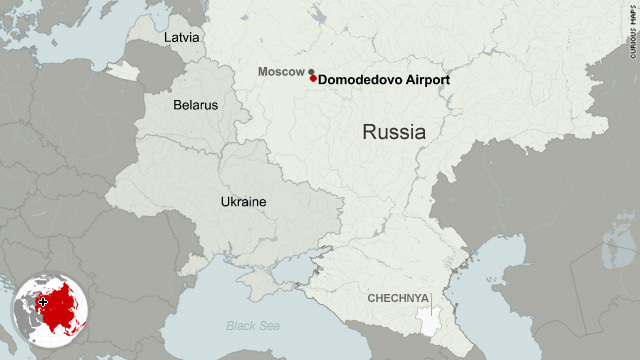 [Updated at 9:37 a.m.] The explosion at Moscow's Domodedovo Airport killed at least two people and injured 20 others, according to the official RIA Novosti news agency. Russia's Investigative Committee confirmed the blast, saying 20 people were affected, although the extent of their injuries was unclear. State TV said the explosion occurred at the baggage claim area of the airport. The explosion occured at 4:40 p.m. in Moscow, RIA Novosti said. [Posted at 9:24 a.m.] An explosion has occurred at Domodedovo Airport in Moscow, Russia's Investigative Committee said. There are conflicting reports of deaths and injuries. I just like the helpful information you supply on your articles. I’ll bookmark your weblog and take a look at once more here regularly. I'm rather sure I’ll be told lots of new stuff right right here! Best of luck for the next!